The reliability-based design optimization of structural systems under stochastic excitation involving discrete sizing type of design variables is considered. The design problem is formulated as the minimization of an objective function subject to multiple reliability constraints. The excitation is modeled as a non-stationary stochastic process with uncertain model parameters. The problem is solved by a sequential approximate optimization strategy cast into the framework of conservative convex and separable approximations. To this end, the objective function and the reliability constraints are approximated by using a hybrid form of linear, reciprocal, and quadratic approximations. The approximations are combined with an effective stochastic sensitivity analysis in order to generate explicit expressions of the reliability constraints in terms of the design variables. The explicit approximate sub-optimization problems are solved by an appropriate discrete optimization technique. 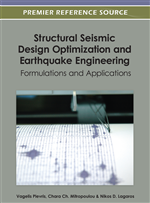 Two example problems that consider structures with passive energy dissipation systems under earthquake excitation are presented to illustrate the effectiveness of the approach reported herein. In a large number of practical design situations the design variables must be selected from a list of discrete values. Standard methods address discrete variable design optimization problems by employing discrete or integer variable algorithms to treat the problem directly in the primal variable space (branch and bound techniques, combinatorial methods, evolution-based optimization techniques, etc.) (Kovács, 1980; Goldberg, 1989; Scharage, 1989).These methods are quite general but are associated with a large number of function calls (evaluation of objective and constraint functions). On the other hand, in many practical applications the applied loads and system parameters may be subjected to uncertainty or variability. Under uncertain conditions the field of reliability-based optimization (RBO) provides a realistic and rational framework for structural design and optimization (Enevoldsen and Sørensen, 1994). Schemes for discrete structural optimization considering uncertainties have not been addressed as frequently as their deterministic counterpart. In most studies, ad hoc optimization algorithms have been integrated directly with a reliability method. For example, in (Hassan and Crossley, 2008), the problem of optimization under uncertainty has been approached by means of genetic algorithms and direct Monte Carlo simulation. As both the optimization and the reliability algorithms require a large number of function calls, numerical costs can be very high. In order to reduce the computational efforts related to reliability analysis, the application of optimization methods in combination with the first-order reliability methods was investigated in, for example, (Tolson et al, 2004, Gunawan and Papalambros, 2007). Another approach for reducing computational efforts is the application of meta-models, such as artificial neural networks (see, e.g. (Papadrakakis and Lagaros, 2002; Lagaros et al., 2008)). These approaches have been applied to solve RBO problems of a series of physical systems characterized by uncertainty models of small and medium sizes (less than 30 random variables). In this work attention is directed to discrete reliability-based optimization of structural systems under stochastic excitation. In particular, excitation models defined in terms of hundreds or thousands random variables (high dimensional models) are considered here. One of the difficulties in this type of problems is the high computational cost involved in the reliability analyses required during the optimization process. This is due to the fact that the reliability estimation of stochastic dynamical systems involves the estimation of failure probabilities in high-dimensional uncertain parameter spaces (Jensen et al., 2009; Valdebenito and Schuëller, 2011). The objective of this work is to present a general framework for solving this class of reliability-based optimization problems. The approach is based on the use of approximation concepts, the application of an effective stochastic sensitivity analysis, and the implementation of a globally convergent optimization scheme. Special attention is focused on the analysis and design of protected structures by means of passive energy dissipation systems. The basic function of these devices when incorporated into the structure is to absorb a portion of the input energy, thereby reducing energy dissipation demand on structural members and minimizing possible structural damage. In this regard, the consideration of discrete optimal design processes for protected structural systems is one of the novel aspects of this work. This type of problem is relevant from a practical point of view since the potential advantages of modern structural protective systems have lead to the design and construction of an increasing number of protected structures for the purpose of mitigating seismic impact.